BERKELEY – Cal will begin spring football practices at California Memorial Stadium on Monday, February 25. 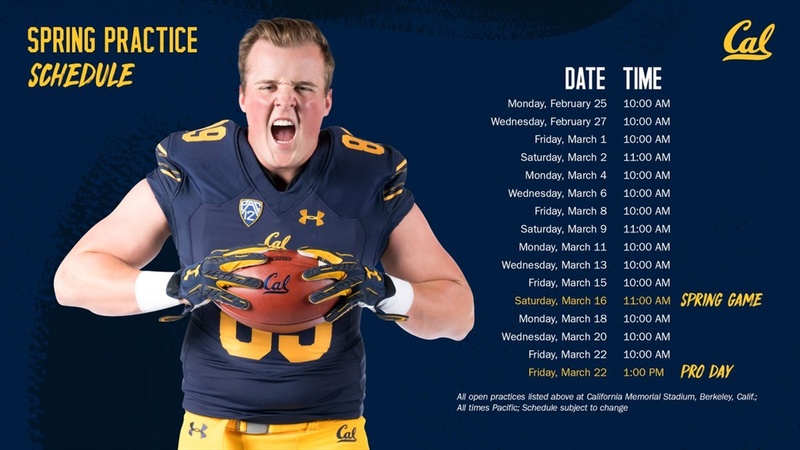 The Golden Bears will hold a total of 15 spring workouts open to the public highlighted by three on Saturdays including the Cal Spring Football Game to be televised live by Pac-12 Networks on March 16 (11 am PT). The on-field portion of Pro Day will also be open to the public on Friday, March 22 (1 pm PT). Additional information on both events will be provided at later dates. Admission is free and attendees can enter California Memorial Stadium through Gate 2 on the north end of the stadium. Signage will direct attendees to open seating areas on the west side of the stadium in Sections E, EE, F, FF, G, GG, H, HH, I and II. All other sections of the stadium including the field and North Tunnel will be closed to public access. Cal will host six games at California Memorial Stadium in 2019 beginning with the season-opener against UC Davis on Aug. 31 before subsequent visits from North Texas, Arizona State, Oregon State, Washington State and USC.